I would say that that was a fun way to lose. Last night was just a case of "Baseball being Baseball". 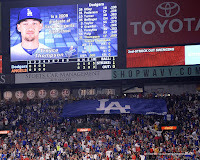 BTW, Pantone 294 once again made their presence known in another stadium. This time they took over Angels Stadium, as evidenced by the photo on the right by Jon SooHoo. In 1995 Hideo Nomo struck out thirteen Rockies to give him a then team record of 50 strike outs in four consecutive starts. In 1996 Mike Piazza hit three home runs against the Colorado Rockies at Coors Field. 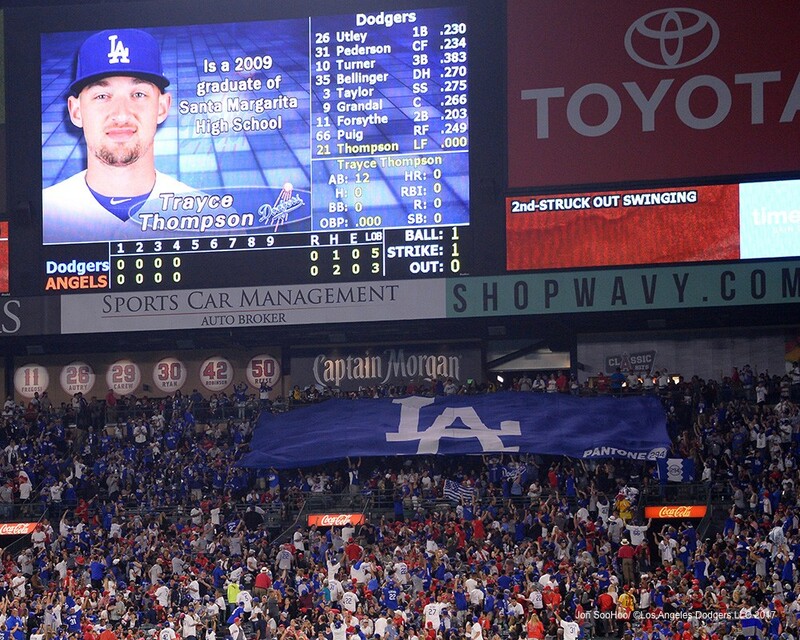 He becomes the fifth Dodger to hit three homers in a game. In 2012 the Dodgers signed amateur free agent Yasiel Puig. BTW, if you are planning on going to tonight's game in Anaheim keep an eye out for the seventh annual Angels Baseball Foundation Gold Ball Mystery Bag. The event will take place at the Home Plate Gate hats (outside of the stadium) beginning at 6:00 PM. The Angels' wives will sell the $40 mystery bags that will contain a baseball autographed by an Angels player or Mike Scioscia. Twelve lucky fans who find their autographed baseball wrapped in gold paper will win four tickets to an upcoming game and a chance to meet the Angels player who signed their ball during batting practice. There is a two bag limit per person and all proceeds from the event will benefit the Angels Baseball Foundation. Go here for more information. Per JP Hoornstra at the Daily News; "Dodgers’ Cody Bellinger’s ‘sneaky’ speed a surprising asset." Funny thing is, Bellinger had no idea he was that fast. He guessed Toles was faster. Blowout Buzz provides a sneek peak at Topps 2017 Bowman Platinum Baseball cards; including the Cody Bellinger card on the right. Go here to check out more preview pics. This is really great. 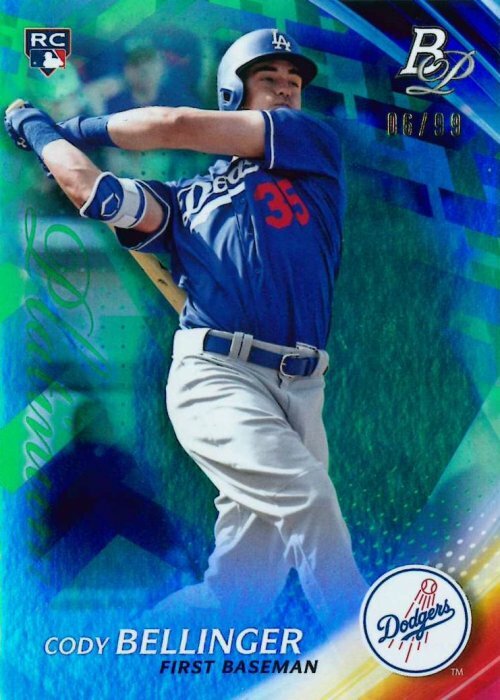 Defgav at Baseball Card Breakdown shares a fantastic custom Cody Bellinger Baseball card using the 1989 Upper Deck design. Check it out here. 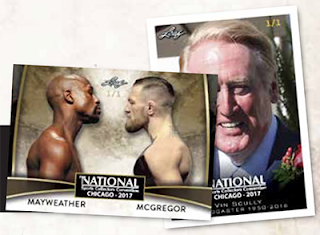 Rick Mueller at Sports Collectors Daily provides some background on one of my all-time favorite regional card sets -- the Bell Brand Dodger cards. Blowout Buzz also provides a look at Leaf Trading Card promos being given out to collectors at the upcoming National Sports Collectors Convention in Chicago in late-July. It includes a Vin Scully card that will be put into each VIP bag. Check out what it'll look like below. 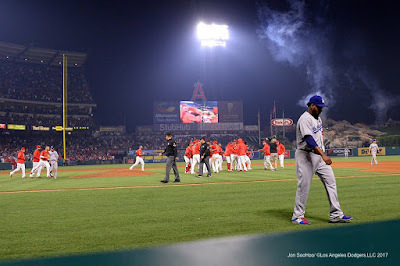 Per Chris Creamer at Sports Logos.net; "Of Anaheim No More, Los Angeles Angels Officially Changed Name." Four OKC Dodgers named to AAA All-Star Game: Willie Calhoun, Wilmer Font, Alex Verdugo, Madison Younginer. Game is July 12 in Tacoma.